One year ago, on the 24th September 2014, Teacher by trade, Mother by nature - THE BLOG - went LIVE. Now, if you are blogger, you will know how nerve wrecking and exciting it is to click that PUBLISH button for the first time. You might find yourself saying "Oh em gee...Sh%& just got real...It's Official...I'm a Blogger...Argh, What have I done!". It's totally normal - it's exactly how I felt on this day too. I already had a lovely community on Facebook, however I felt there was something missing. I wanted to share more, connect with and inspire more people and find a blogging tribe (people who spoke 'my blogging language'). And that is exactly what I have been doing for the last year and hopefully will continue to do so for years to come. So for the month of September, instead of looking at what's happening in our lives (see Currently posts to see what I've been up to lately), - I am going to be TAKING STOCK of My First Year of Blogging - linking up some of my fave posts, and sharing blogging tips and resources I found useful in my first year. Enjoy! Making: friends with bloggers. I have 'met' so many amazing bloggers, and several have become very good friends of mine. You know who you are - thanks for being YOU! You all ROCK! Wanting: to get #inthepicture with my kids every month, inspired by this post by Bron (Maxabella Loves). You can read my posts about being in the picture with my kids, here. Looking: for a few more Guest Bloggers...if you are interested, please feel free to send me a message via Contact Page and we can have a chat. I would love to hear from you. Playing & watching: The Blog Beautician videos - Dana Fox is AMAZING - she shares tips and tricks for blogging, HTML, photoshop and more...I completed Dana's '7 Day Blog Bootcamp' a while ago and learned a lot in just one week and thanks to her, my blog is thriving because of the changes I made. (Thanks Dana for your inspiration). 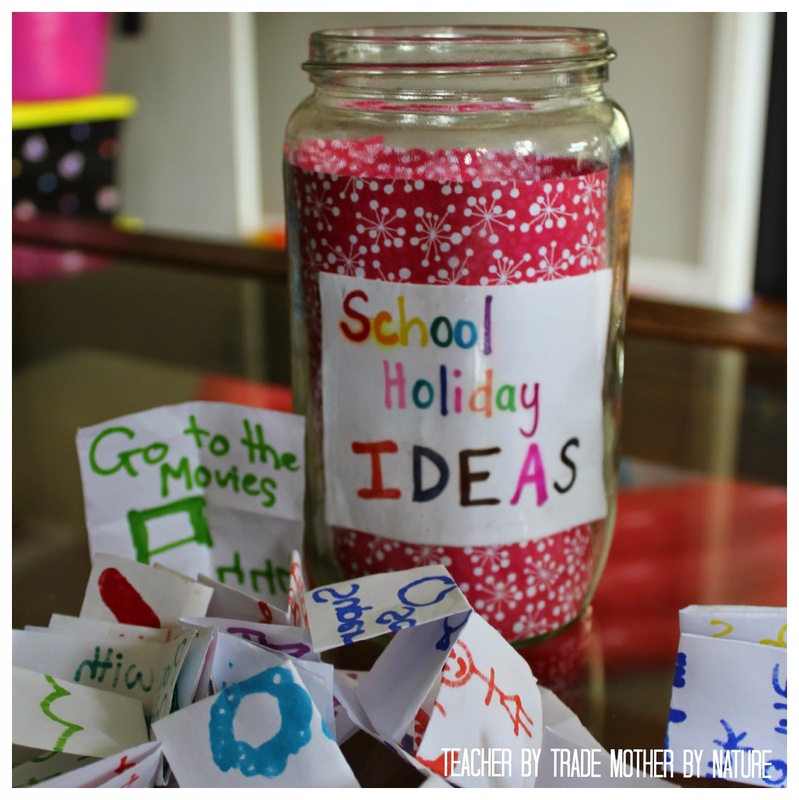 Enjoying: the constant traffic that Happy Hooligans is bringing to my blog, after including my DIY Baby Jar Advent Calendar post in one of their round-up posts! Waiting: for my son to go to sleep, so I can get my blogging done. This is when I can dedicate a good amount of time to my blogging. No nap = no blogging. The rest of my blogging time usually happens after my daughter goes to bed. Liking: the Blogging Facebook groups I am a part of! So much knowledge shared in one place. There are many groups out there, or you can do what I did - create your own and invite some of the blogging friends you have made. Wondering: what my life was like before blogging. It's easy to become consumed in the blogging world - warning: it's very addictive. Pondering: what is in store for Teacher by trade Mother by nature for the rest of 2015 and the new year. Considering: another blog design - ha! Not for a while at least - I love my new blog design - it's a huge change from when I first started, I even blogged about it - C for Change. Buying: Building a Framework - this is the Ultimate Blogging Handbook! A must-have for all bloggers, beginners & expert. Abby, from Just a Girl and her Blog, shares everything you need to know about blogging - I can't recommend it enough. Abby is such an inspiration to me and many other bloggers around the world. 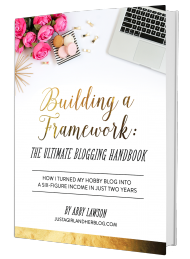 I am so glad I bought this framework - it has definitely helped me become the blogger I am today! Thank you, Abby. Watching: a 5 minute video of someone using my blog and giving me constructive feedback via PEEK. Hoping: to set up a Newsletter for my subscribers. It's on my to-do list. Cringing: at the quality of photos I shared on my blog when I first started! What was I thinking? I have purposely left them because, for me, it shows my growth as a blogger. Needing: and having a blogging break is one of the best things a blogger can do. I took some time out from the blog when life just got too busy - e.g. when we had the kids birthdays (3 in one weekend) and when we moved out of our home (moving alone is stressful enough). Then there have been times when I just needed to take a step back from the screen and live life - spend time with my kids/family, have a cuppa with my girlfriends, watch a movie with my partner...the things that I missed out on because I was too focussed on my blog - the blog was taking over my life...so I put a stop to it. Sometimes you just need to step away from the screen, and THAT's OKAY! Questioning: Have you ever looked back at old photos and said "I remember that girl?". Following: so many bloggers. I created an Ultimate List of Blogs I Love list to keep track of them all. I do need to update it, so if you would like to be on the list, let me know - I would love to add you. Noticing: I am super close to reaching another blog milestone = 1000 LIKES on Facebook. I would love you forever if you head over to Teacher by trade Mother by nature on Facebook and click LIKE (from your personal account). Knowing: there is so much more to learn about blogging. Can't wait to learn new tips and tricks. Organising: my blog using The Organised Housewife's Blog Planner 2015/2016. Thinking: yes, blogging does require a lot of work, but it is worth it, especially when people thank you for inspiring and motivating them. Admiring: this honest post about How I Feel About My Body. I almost didn't click Publish, I am so glad I did. If I start to feel insecure about my body, I read this post. Sorting: through all of my posts - I have published 222. WOW! Bookmarking: Blog Tips via GreatFun4Kids - From blog tips & design to Social Media and Buttons - Simone has got you covered. Disliking: that I often find myself comparing my blog to others...I just need to STOP! I am unique and so is my blog. Blogging would be more fun if we just didn't compare ourselves, right? Giggling: at all the Wacky Wigs I have worn. Feeling: happy, overwhelmed, excited, great, exhausted, nervous, anxious, sad, frustrated - all in one year. Phew! Blogging is tough - but at the end of the day, I LOVE IT! I wouldn't be doing it if I didn't. "Be Organised, Be Inspired, Be Creative and Be Yourself"
Hearing: people tell me and thank me for inspiring them, and motivating them warms my heart. THANKING: every single one of YOU for supporting me on my blogging journey. Inspiring you, inspires me to be a better blogger and motivates me to continue every day. Thank You for all the lovely, positive Comments, Likes, Shares, Pins, Tweets, Messages, the lot - YOU are all amazing - and it means the world to me that you keep coming back for more, so THANK YOU. I appreciate it. Thank you Lydia! So glad I 'met' you and we became blogging friends. Congratulations on your first year! Isn't it amazing how much we can pack into that time? I'm definitely going to check out 'Building a Framework'. Thanks for the tip! Thank you! This is really only a snippet of what I have done in my first year of blogging! I honestly can't believe it's been a year - of full on blogging. I am blessed to be a part of such an amazing community! And definitely check out the framework - it's the BEST resource - every blogger should have it! Worth every penny! Congrats, what a milestone! I'm coming up to my 1 yr too, amazing what you can learn in 12 months! I just did a PEEK review too, kind of freaky! Thanks Mumma McD --ooh congrats to you too! 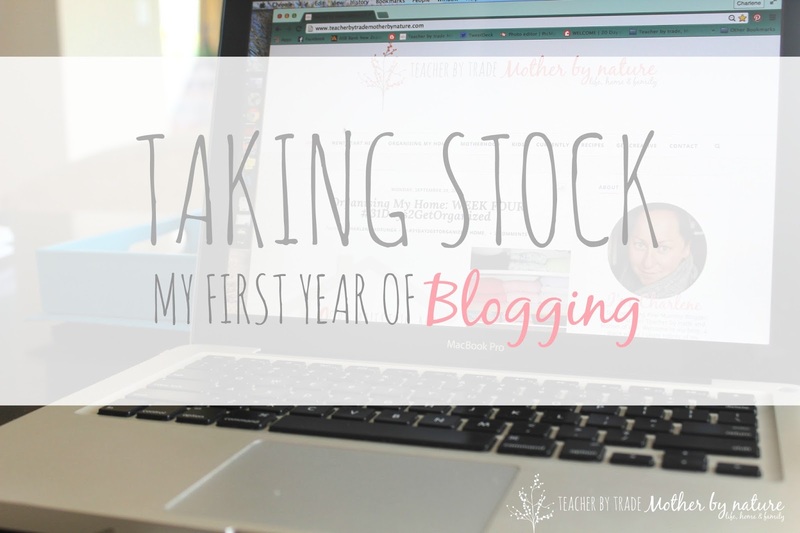 I hope you are going to do a recap of your first year too - would love to read it! Congratulations on your 1st blogiversary Charlene! It's a great milestone to celebrate because there's so much growth and development in the first year. I enjoyed reading your reflections on your first year! Thank you so much Hilda, this is only a snippet of what I have learned - I could easily do a series! So lovely having a fellow BBOB visit my blog! thank you. Thank you so much Vicki :) I appreciate it! I absolutely love getting comments on my blog...I have over 1000 comments - I am so thankful to everyone who visits and comments! Blogging has such an awesome community. Good on you for your first year. I have to agree the making friends with other bloggers is the sweetest part! Nice to meet another teacher blogger! My blogging friends are awesome, in fact I consider ALL bloggers my friends - I have been blessed to have 'met' so many great bloggers who support me and I am always looking for new blogging friends - heading over to check out your space. Thanks Shannon, sharing the blog love right back at ya! Thanks for being an inspiration and allowing me to be a part of your awesome link up! Taking Stock is great - I am so glad I shared my first year like this. Thank you so much Bron, as always... you inspire me - you were one of the very first bloggers I followed, way back when I set up my Facebook page for Teacher by trade Mother by nature...before the blog even existed! Thank you for being YOU and supporting ME on my blogging journey! Sending you a virtual hug to say thanks. Happy Blogaversary - may it be the first of many! Hope one is fun! Thanks for the shout out for the Ultimate Rabbit Hole and for joining the party every week, I always enjoy your posts so much! Thank you Sammie, you are awesome! Love your blog, you're such an inspiration to me. Thanks for your kind words, I really appreciate the support. Congratulations on your first year, awesome to see how well you doing. Love the baby jar advent. What a great look back and round up. I agree, blogging certainly changes you and you grow. It's so cool to read what others are up to, and how I grow as a person through it! Thanks for sharing! I love that advent calendar! I don't have time to make one like that but I'm thinking about getting a little tea light one for christmas. Congratulations on your first year! Sounds like you have achieved a lot! Congrats on your first year!! I love your roundup of what you've achieved (and I'm going to look into your advent calander to see what I can come up with myself in the next few months). Happy Blogiversary!! It goes by so fast right? I can relate to comparing to other blog but you gotta just brush it off and do your own thang :) Well done, you've done an awesome job in such a short period of time! :) XO :) Go you! Well done on a year, and so many posts! It's nice to reflect on how far we've come, I cringe over some of my old photos but I leave them too.